On 2011 Manuel Antonio National Park was selected in the Forbes Magazine list of the 12 most beautiful natural parks in the world. 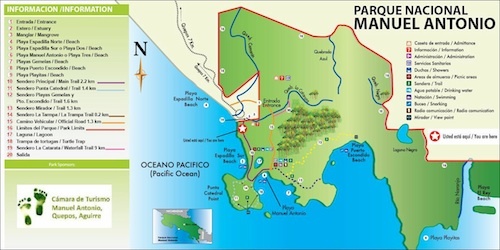 The area where the Manuel Antonio National Park is located was first populated by an indigenous community named the Quepoas, which gives name to the town of Quepos. With the arrival of the conquistadores, the land was used for agriculture and was later purchased by the United Fruit Company. The area that currently constitutes the park was bought by foreigners that impeded the access to locals. This situation motivated the integration of a pro National Park committee that convinced the government and local authorities to purchase the land, leaving it under the government's protection and administration as a National Park, currently under the direct administration of the Central Pacific Conservation Area (ACOPAC), part of the National System of Conservation Areas (SINAC), part of the Ministry of Environment, Energy and Telecommunications (MINAET). 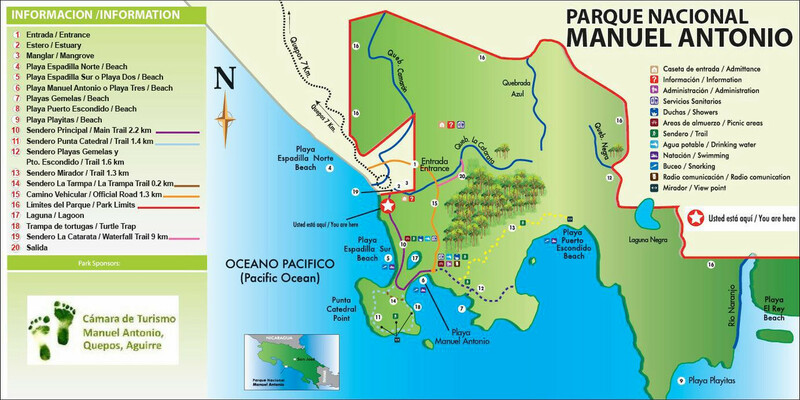 Manuel Antonio National Park is a small biological island inside an area dedicated to activities such as agriculture, cattle farming and high end tourism development. It is the smallest national park in Costa Rica, and famous around the world for its scenic beauty, which combined with its ease of access and great biodiversity found in such a small area, makes it the most visited protected area in Costa Rica by both national and international tourists of all kinds; from surfers to ecotourists and bird watchers. It has several protected coves with white sand beaches amidst exuberant primary and secondary tropical forest, mangrove patches, beach vegetation, marine protected environment, several islands and a 14 hectares lagoon. Its most famous attribute is Cathedral Point, which was once an island, but due to sediment accumulation over time it connected to the mainland, forming a “tombolo” with 2 white sand beached on opposite sides. Climate is typical to the sea-level tropics. Average year-round temperature is around 80 degrees fahrenheit; and average yearly rainfall is 3.875 mm. Driest months are from January to March, and rainiest months are from August to October. 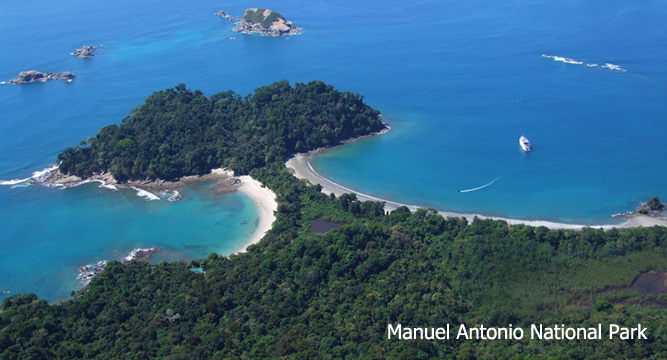 Manuel Antonio National Park packs an impressive diversity of wildlife for its size. Home to 109 species of mammals and 184 species of birds, visitors exploring the well marked trails will be able to easily spot both Brown-throated Three-toed sloths and Hoffman’s Two-toed sloths, Mantled Howlers, Squirrel Monkeys and white faced capuchin monkeys; as well as white-nosed coatis, and several types of iguanas, snakes and bats. Included in the 184 bird species are toucans, woodpeckers, mot-mots, tanagers and many sea birds which nest in the islands around the park. Dolphins may also be observed in the maritime area, and the occasional migrating whale. Since the animals are so used to visitors, this is one of the best places in the world to see them up close. Park is open to the public year-round, from Tuesday to Sunday (Closed on Mondays) from 7:00 a.m. to 4:00 p.m. The entrance fee is $16 per person, children under 12 years old get in for free. The entrance tickets may only be purchased in COOPEALIANZA, a small bank just outside the park. Inside the park there are general information signs, drinking water, restrooms, showers, marked trails, lookouts and local guides. The best way to enjoy the beauty of the Manuel Antonio National Park and other area attractions is from your very own Private Vacation Rental Home. Take a look at the many options available in our Properties Page.